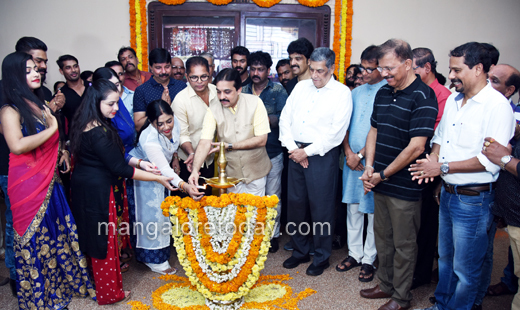 Mangaluru, Aug 11,2017 : Tulu comedy movie ’Aare Marler’ brought out by Bolli Movies has hit the silver screen on August 11 following a grand ceremony held at Prabhath Theatre in the presence of Karavali College Managing Director Ganesh Rao, Udupi Diocese PRO Fr Denis D’Sa, the star cast of the movie and a host of other dignitaries. Arjun Kapikad is the hero of the film while Nishmitha makes her coastalwood debut in the movie. As for the rest there are Saikrishna Kudla, Satish Bandale, Aravind Bolar and Bhojaraj Vamanjoor who shine through effective portrayal of their respective roles. The film has four songs sung by Supriya Lohith, Devadas Kapikad, Arjun Kapikad and Nakul Abhayankar. The story screenplay, music and direction are by Devadas Kapikad while the music has been scored by Kadri Manikanth.